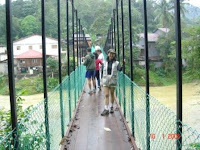 On 1st Oct 2006, our friend Yvonne Kew from Kuantan volunteered to bring us to climb the famous Bukit Lembing (Lembing Hill) which is about 42 km northwest of Kuantan. 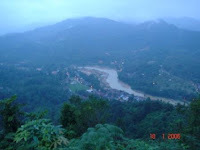 Bukit Lembing offers a beautiful sunrise view as well as the surrounding sleepy town of Sungai Lembing (Lembing River). It is rainy season in October and if it rains in the morning we will continue with our sleep and do the climbing in our dream. We were lucky that it was not raining but unlucky that we could not continue our sleep at the beautiful Swiss Garden Hotel resort. Our morning call was at 4am, imagine the best time to sleep. The journey to Sg. Lembing will take almost an hour. The climb or rather walk up the hill is almost 45 minute in the dark along the concrete steps with railings at the side. Hoping to see sunrise but unfortunately it was drizzling and too misty to view. 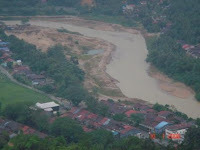 We plan to have 'tea tarik' up there and enjoy the scenic view of Lembing town. You can see the whole Lembing town and the Sg. Lembing. The river a t one time flooded the whole town. Imagine the whole town was submerged in water. 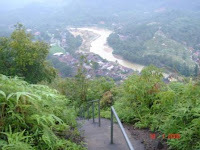 Many villagers had to climb this hill to escape the flood. Until today you can find the marking of the flood level, marked as a red line on the shop front. After our 'tea tarik', we waited till it was brighter before walking down. All the way down to the morning market to have our breakfast. 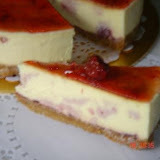 This town is also famous for 'tow foo" (bean curd) soft and 'slippery'. 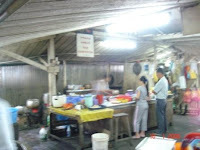 The folks here produces the traditional coconut biscuit 'yer pang' which is popular among its visitors. There is not much activity in this town because most of the younger generations have left this sleepy (really sleepy) town and only to come home during weekends or the festive holidays. This town is prone to flooding especially during raining season. 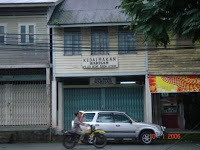 After eaten the famous Lembing 'tow foo', we shop for the "yer pang" and took a photo of the flood markings on the shop front. In the morning it is cool and refreshing in Sg. Lembing and we decided to explore the town from one end to other. There is a muzeum in Sg. Lembing and we didn't get to visit it because it was weekend. The largest underground tin mining in the world is in Sg. Lembing but today sad to say has stop operation. 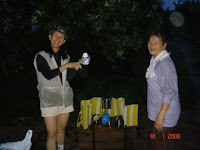 We will plan to come again and this time during the dry season hopefully we will catch the sunrise. i went up to Bukit lembing yesterday (8/6/08), but feel sad caused cant catch the sunrise view oso but very enjoy caused i went in a group of 40 persons and on top of the hills so crownded. Hi, catching the sunrise at Sg. Lembing requires a bit of 'luck' or timing and weather observations. Try to avoid going during rainy weather or cloudy days. Best during dry and cloudless days. During our last visit we didn't get to see sunrise. Last week a group of friends arrived at Bukit Lembing at 4.30 am were also disappointed. But! we friends and overall view it still will be enjoyable. I'm a Squidoo lensmaster, and I'm inviting you to join me. Find and share recommendations online by building a lens. Squidoo can help you build a lens website for free. Click the link below to get started. Squidoo Homepage.